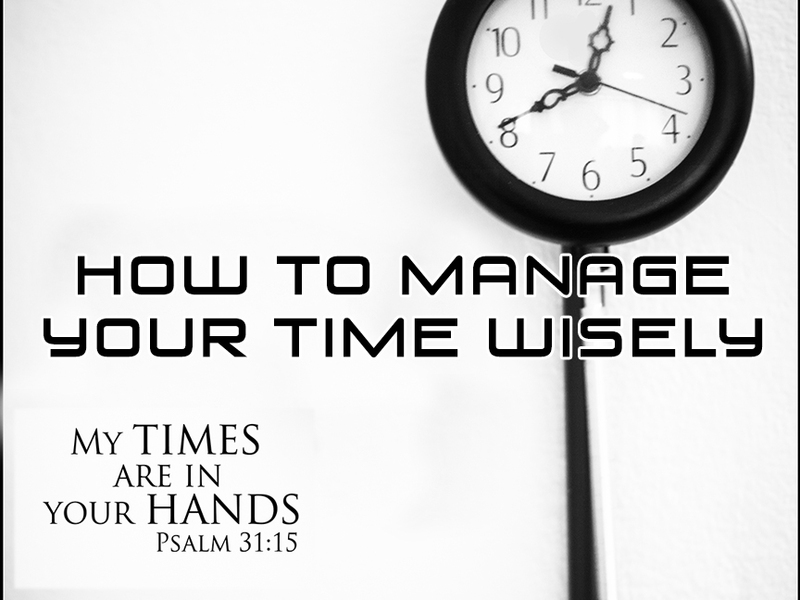 Turn in your Bibles to Ecclesiastes 3 for our message titled, “HOW TO MANAGE YOUR TIME WISELY.” As we head back to work, school, and daily responsibilities, we hear sayings like—“time flies,” “time marches on,” “watch your time,” and my favorite – “I don’t have enough time.” These clichés are not very accurate. Time is not money. What you do with your time may or may not generate money. Time does not fly or march on. We are flying by and marching on in life. We cannot watch time. If anything, time is watching us. And, by the way – we all have the same amount of time! The CEO of a Fortune 500 company has the same time as the homeless man on the streets. The point is—we have a very poor understanding of how to manage time wisely. Thankfully, the answer is found in the Bible. This timeless book has many principles on how to manage time wisely. It is a simple message on the surface and yet it is a deeper message. Eccl. 3:1-11 1 To everything there is a season, A time for every purpose under heaven: 2 A time to be born, And a time to die; A time to plant, And a time to pluck what is planted; 3 A time to kill, And a time to heal; A time to break down, And a time to build up; 4 A time to weep, And a time to laugh; A time to mourn, And a time to dance; 5 A time to cast away stones, And a time to gather stones; A time to embrace, And a time to refrain from embracing; 6 A time to gain, And a time to lose; A time to keep, And a time to throw away; 7 A time to tear, And a time to sew; A time to keep silence, And a time to speak; 8 A time to love, And a time to hate; A time of war, And a time of peace. 9 What profit has the worker from that in which he labors? 10 I have seen the God-given task with which the sons of men are to be occupied. 11 He has made everything beautiful in its time. Also He has put eternity in their hearts, except that no one can find out the work that God does from beginning to end. This morning, if you are having trouble with time management, it could be because you are looking at time from a purely earthly perspective. You need to look at time from a spiritual perspective—from a biblical perspective. Lately, I’ve had many questions and comments about time from people of all ages, men and women. So, we will look at six principles for managing our time wisely. I. RECOGNIZE THAT TIME IS LIMITED AND IT DOESN’T BELONG TO US. For e.g. If you don’t believe that, just talk to the parents of the little baby that was killed when a bus hit a light pole that fell on a little baby in a stroller. Time is a gift from God to each of us. Many of us are wasting precious time on frivolous things. When we waste time, remember—we are on God’s clock. Add up the amount of time we spend watching TV or on social media. If you spend 2 hours a day on TV and an hour on social media (Not counting the time you are saying hello to friends and family), that’s 3 hours a day—21 hours a week (I’m being very conservative). Which means you spend almost one whole day on things that do not matter. From 8 am to the next day 5 pm, you have frittered away. II. MAKE A LIST EVERYDAY AND TACKLE THE MOST DIFFICULT TASK FIRST. Right after God created Adam and Eve, He gave them a list—Genesis 1:28-29 28 Then God blessed them, and God said to them, “Be fruitful and multiply; fill the earth and subdue it; have dominion over the fish of the sea, over the birds of the air, and over every living thing that moves on the earth.” 29 And God said, “See, I have given you every herb that yields seed which is on the face of all the earth, and every tree whose fruit yields seed; to you it shall be for food. Zig Ziglar would often challenge—make a list as if you were leaving on a vacation tomorrow and start with the most difficult task first. When we don’t have a definite plan, we do what we want to do and not what we need to do. By the way, many people never start on the important things because they are too afraid of making mistakes. The key is excellence and not perfection. III. PICTURE WHAT SUCCESS LOOKS LIKE IN ONE-YEAR, FIVE-YEARS, TEN-YEARS, AND SO ON. On the night before Jesus was crucified, Jesus prayed to His Father in John 17:4 “I have glorified You on the earth. I have finished the work which You have given Me to do.” While on the cross He made 7 cries. The sixth cry was “It is finished!” (John 19:30) There were thousands more blind who needed sight and deaf who needed to hear and hungry who needed to be fed; but the critical task of giving His life for our sins was done. Young person – What is it that God wants you to do? Where does God want you to be in the next year or five years or ten years? Couple – What is God’s vision for your marriage in the next year, five-years, ten-years and so on? Nicole and I often discuss what we want to look like in the next few years. Christian – What is God’s vision for your Christian life? Where do you want to be in your Christian walk? Clearview – In 2008 we began from the ground up and God gave us a vision for one-year, five-years, and ten-years. Believe it or not, one by one each of those things have come to pass! God is honoring His vision for us. If we can’t see it, we won’t reach it. We have to be reasonable, as Ted Engstrom’s wisely remarked: “We terribly overestimate what we can do in one year and underestimate what we can do in five.” Some things take time but they are coming. IV. DON’T BE SO “TIME BOUND” THAT YOU FORGET TO SMELL THE ROSES ALONG THE WAY. God does not want us to be so goal oriented that we loose sight of the roses along the way. What are the roses of life? The roses of life are not things but people and relationships. They include our spouse, children, family, friends, and people in general. Those children will not be little forever; our spouse will not be by our side forever. What did God do? Right in Genesis God set the standard. Genesis 2:2-3 2 And on the seventh day God ended His work which He had done, and He rested on the seventh day from all His work which He had done. 3 Then God blessed the seventh day and sanctified it, because in it He rested from all His work which God had created and made. God gave us one day to not be “time bound”—a day to rest our body, restore our relationships, and refocus on Him. He wants to enjoy the abundant life. It doesn’t have to be Sunday. For me it cannot be Sunday. It is my busiest day. We are starting a Saturday evening service to help people have the Day of Rest and Worship. V. GIVE GOD THE BEST OF YOUR TIME AND HE WILL HELP YOU MAKE THE MOST OF YOUR TIME. What is the best time of the day? There is no substitute to starting your day with Bible reading, a good devotional book, and prayer. Even Jesus, the second person of the Godhead, “in the morning, having risen a long while before daylight, He went out and departed to a solitary place; and there He prayed.” (Mark 1:35) Unless you are working all night, you should begin your day with prayer. What’s the use of looking for help when you have already in the valley of the shadow of death! A day that begins on our knees will always end in victory. VI. MOST IMPORTANTLY, IT IS ALWAYS THE RIGHT TIME TO RECEIVE CHRIST. Today is the day to receive Christ as your Savior. Not only will your sins be forgiven but you will be amazed how this decision will change your perspective on time!